79 posts categorized "French Fridays With Dorie"
If you remember my craving for tabouleh a couple of weeks ago, I’m happy to report that I finally got around to it. 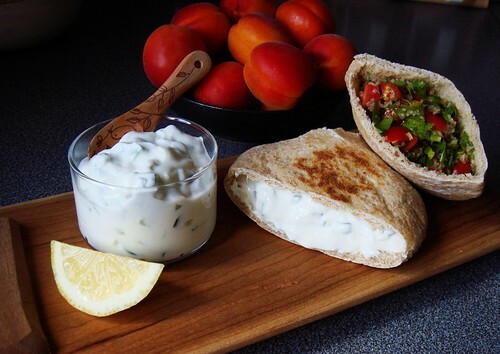 This week’s feature recipe for French Fridays with Dorie is tzatziki, the tangy creamy yogurt cucumber dip that is kissing cousin with raita. Except in lieu of taming the heat of Indian curries, it is enjoyed as a refreshing accompaniment to more Mediterranean flavours. I was going to prepare a dinner of mezzes but I got tired after the tzatziki and tabouleh were done. Recovering from a 24 hour flu and still looking for my appetite have that effect on me. Instead of an array of small dishes served hot or cold, I stuffed a couple of whole wheat pita pockets with the dips and called it a night. Who knew chopping and stirring could be so tiring? Slacking off feels awesome! I am a fan of tartine, French open-faced sandwich. I love the daintiness. I love the colourful presentation. I love the lightness. Unfortunately, I was underwhelmed when I saw the recipe for Dorie Greenspan’s Dieter’s Tartine in Around My French Table. Tomato, cucumber, chives, herbes de Provence, and non-fat fromage blanc pile on a piece of bread? It certainly sounds light but also boring. Knowing a thing or two about dieting, I crave that bright vibrant flavour often missing from diet-friendly dishes. No way could I bring myself to follow Greenspan’s recipe even for the sake of French Fridays with Dorie. 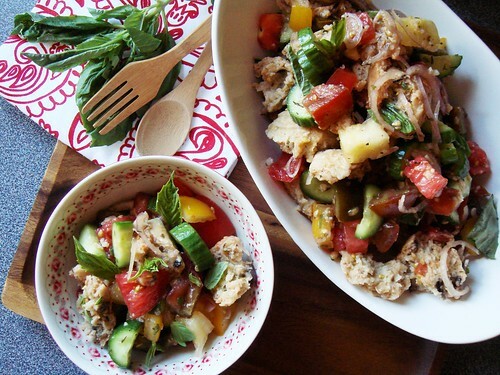 When I looked at the list of ingredients, I immediately thought of Italian bread salad panzanella. Once I swapped out the fromage blanc with a light drizzle of fruity olive oil, I had the makings of an intensely flavoured summer dish. Still diet-friendly, mind you, but so much more interesting. Plus I could use so much more vegetable in proportion to bread. Not a bad adaptation at all. I am late to the swordfish party. As much as I enjoy seafood of all kinds, I am not very adventurous when it comes to cooking fish at home. The cooking itself is simple enough. Most cuts of fish are best served simply to let the flavour shine. What stops me from exploring is cost. A dinner for two featuring sustainably caught fish can easily cost me $20 for the fish alone. At the fishmonger, swordfish steaks definitely take up a place of pride as Dorie Greenspan wrote in Around My French Table. Thankfully, they are in season right now and I was able to get a gorgeous 200g piece under $10. Another cost saving tip I learned from Greenspan is that rather than cooking the inch-thick swordfish steaks on a grill, the French prefers to serve thinner portions seared in pan. That’s music to my ears because I could stretch that fillet into a dinner for two by simply slicing it in half. With all other ingredients readily available at home, my swordfish dinner is unexpectedly affordable and elegant. 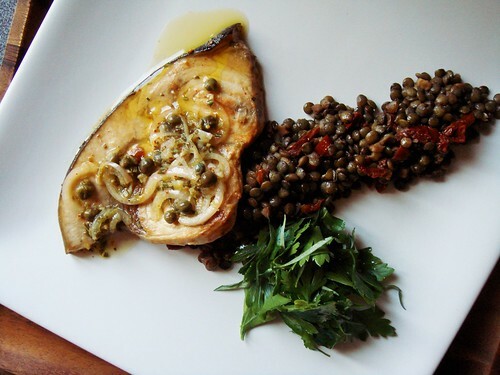 Even the description of the dish sounds restaurant-worthy: Pan seared swordfish served with caper rosemary vinaigrette, frilly herb salad, and lentils with sundried tomatoes and black olives. I wish I have intelligent things to say about this plate of Goat Cheese & Strawberry Tartine. The timestamp on the photos told me I made the open-faced sandwiches exactly a year ago when I happened to have all the ingredients at home. That very weekend, a three-year relationship came to an end. The ingredients came from the famed Marche Jean Talon in Montreal and I drove home heartbroken. Only a year? More like a lifetime ago. Thankfully it is all behind me now and I have my hands full with other concerns. I am also thankful that I made notes way back when. 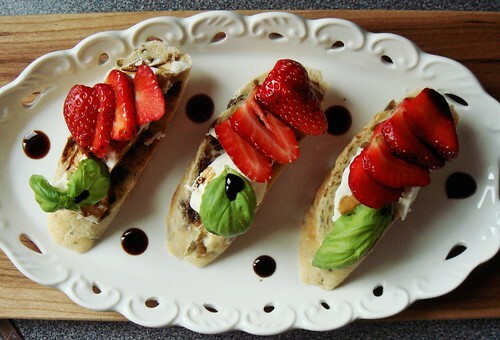 I used green olive baguette from Première Moisson, unripen goat cheese from Qui Lait Cru Fromagerie, local Quebec strawberries from Ile d'Orleans, home-grown basil, and balsamic vinegar. Looking at these photos reminds me of spring 2012. Not another puree vegetable soup! That was my enthusiastic reaction to this week’s recipe of Creamy Cauliflower Soup Sans Cream from Around My French Table. Although I am happy that my immersion blender is earning its keep, I am not thrilled with making yet another variation of the same soup. And then a brilliant idea dawned on me. For many of us, we are busy planning for holiday parties in the next few weeks. I don’t know about you but I certainly can use some help with make ahead dishes. This soup fits the bill perfectly. Why serve the velvety soup in a soup dish when I can fashion them into cute little soup shots? The smooth texture means my guests don’t need to fumble with spoons or messing up their elegant outfits in the process. My vegan version of the soup is made with cauliflower, onion, celery, garlic, vegetable broth, and a touch of ras el hanout. I topped each shot with a toasted pecan half and a small piece of apricot rosemary crisp. 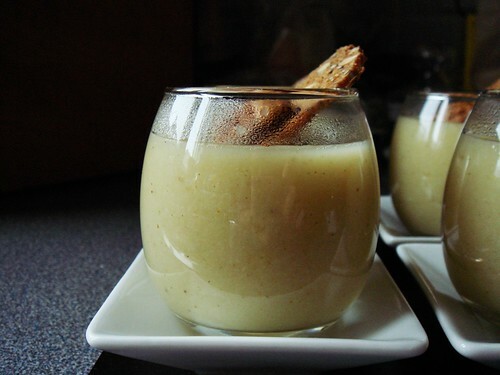 Just a taste of the warm and cozy soup is a great addition to a cocktail party menu. I love quiche but not enough to jeopardize my diet. Cooking the third quiche recipe (after Spinach & Pancetta and Apple Leek Goat Cheese) from Around My French Table got me thinking. What makes a quiche fattening? The flakey pastry shell and the cream of course. Eggs, cheese, and savoury fillings are heartily endorsed by my health-conscious mind. 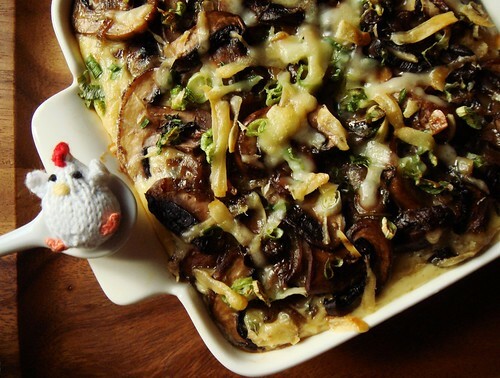 I was inspired to create an egg dish based on Dorie Greenspan’s Mushroom Shallot Quiche. The pastry shell provides structure and the cream thickens with rich velvety texture. Making a crustless quiche using milk would only result in all the filling sinking to the bottom. However, a custard made with milk and eggs immediately calls to mind bread pudding. Stale cubes of bread add bulk to the custard and prop up the sautéed mushrooms. That was how my version of Savoury Mushroom Shallot Bread Pudding came about. Cold weather means comfort food. It is a welcome change because most comfort food involve the ease of one pot meal. Fewer dishes to wash is always a good thing. With the release of Yotam Ottolenghi’s and Sami Tamimi’s new publication Jerusalem: A Cookbook, my love for Middle Eastern flavours is renewed. I had the pleasure to attend their book signing / interview event last Sunday. Their passion for cooking and sharing familiar tastes of their childhood inspired me to explore further into the vibrant world of Middle Eastern cuisine. 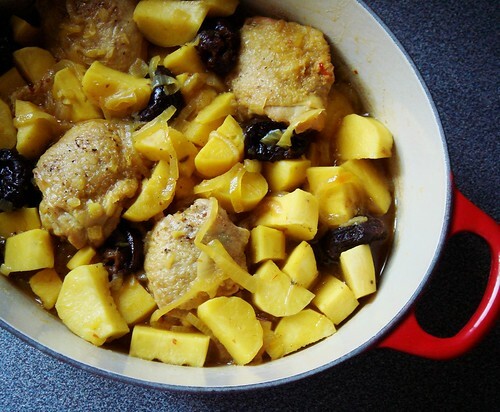 What a lucky coincidence that this week’s recipe for French Fridays with Dorie is Chicken Tagine with Sweet Potatoes and Prunes. I made the recipe in half portion with four pieces of chicken thigh braised in the fragrant broth of saffron, onion, prunes, and sweet potatoes. The hint of cinnamon, star anise, bay leaf, Aleppo pepper, and honey added depth and sweet complexity. You may wonder why my tagine was tinted a rich shade of saffron through and through, including the sweet potatoes. The secret was satsumaimo, Japanese sweet potato. It seems to me every soup recipe in Around My French Table ends up getting the puree treatment. I enjoy the creamlessly creamy sip obviously but the cooking technique is all the same. Where are the challenges? What about surprises? If you answer “garnish”, well, you get my nod of agreement. Greenspan offered lots of garnish suggestions in her cookbook including swirls of crème fraiche, pesto, croutons, toasted nuts, or finely chopped vegetable. All very elegant and very French. Lately, I am not in the mood for elegance. I want something hearty but not fattening. I want my meal to look rustic without all the fuss. 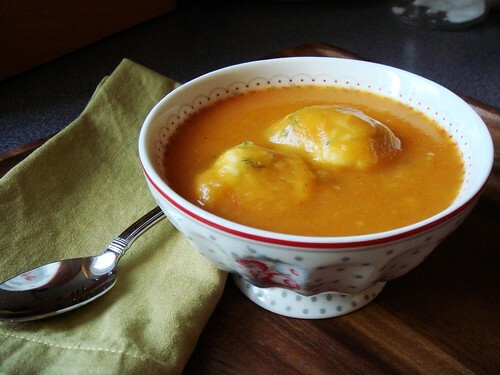 When I saw herb dumplings featured in soup week at The Kitchn, my heart skipped a beat. This is a great play on chicken and dumpling. I had to try it with Spur-of-the-Moment Vegetable Soup we’re making this week at French Fridays with Dorie. 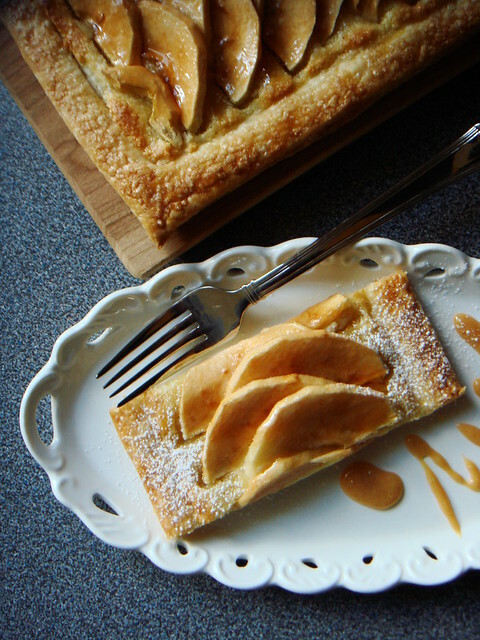 The combination of apple and pastry is alluring at this time of year. I am not picky. My craving can be cured by handsome double crust apple pie, flakey apple strudel, homely apple dumpling, or in today’s case, an elegant apple tarte fine. The recipe for this week’s French Fridays with Dorie is descriptively named Crispy Crackly Apple Almond Tart. The crispy and crackly texture is provided by layers of phyllo pastry. While I can never turn down a piece of baklava, I do not enjoy working with phyllo dough. I know that they are convenient but brushing those paper thin layers with melted butter is not my idea of fun. Too messy! Luckily, Greenspan’s recipe suggested the alternative tarte fine made with frozen puff pastry. I don’t mind puff pastry ever since I found a good source for already rolled out sheets made with butter. But why the direction to make individual tartlets with all that cutting and trimming? I don’t want to waste even one scrap of puff pastry. That was how I decided to make two rectangular tarts filled with almond frangipane and thinly sliced Northern Spy apples. I know little about Basque cuisine or culture. 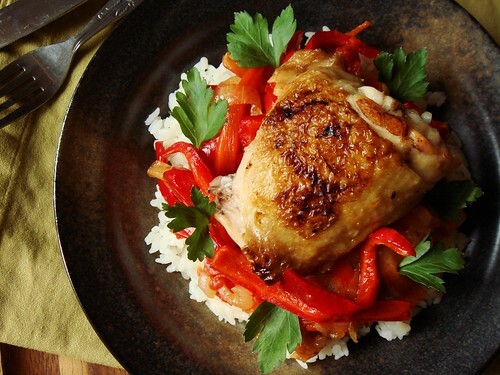 However, if you say piperade, my ears perk up because I always love the flavourful mix of sweet peppers and onions. That’s my favourite mix in for omelettes, only second to liver and mushrooms (hunter style)! Making Chicken Basquaise for French Fridays with Dorie was a joy as soon as I noticed the big batch of piperade for braising chicken thighs. I loosely followed the recipe based on ingredient availability and scaled down to two pieces of chicken thighs. I built my piperade with four sweet shepherd peppers, a big Vidalia onion, one clove of garlic, one red finger chilli, and a few spoonful of canned diced tomatoes. The seasoning of thyme, bay leaf, piment d'espelette, and tomato paste imparted just the right amount of complexity. However, I am most pleased with my substitution of dry vermouth over white wine to deglaze the pan.